As day blends into dusk, a roaring fireplace or fire pit provides priceless ambiance and comfort to an outdoor space. Design preferences and artistry can truly shine when constructing a customized fire feature, inviting the utilization of endless varieties of stones and veneers. Location and structure speak worlds to the experience of the fireplace itself. Each fire pit can act as a standalone structure in the center of a gathering area, blend with an existing structure, or perch before a stunning landscape's view. Watson Supply provides all necessary accessories and materials to create a safe, durable, and elegant fire pit or fireplace design. A distinctive fireplace structure can often act as the focal point of a dynamic hardscape design, melding the comforts and practical elements with delicacy and beauty. Fire pits act as an ideal complement to a seating area or similar gathering space. Its standalone potential provides a greater range of design and structure opportunities. 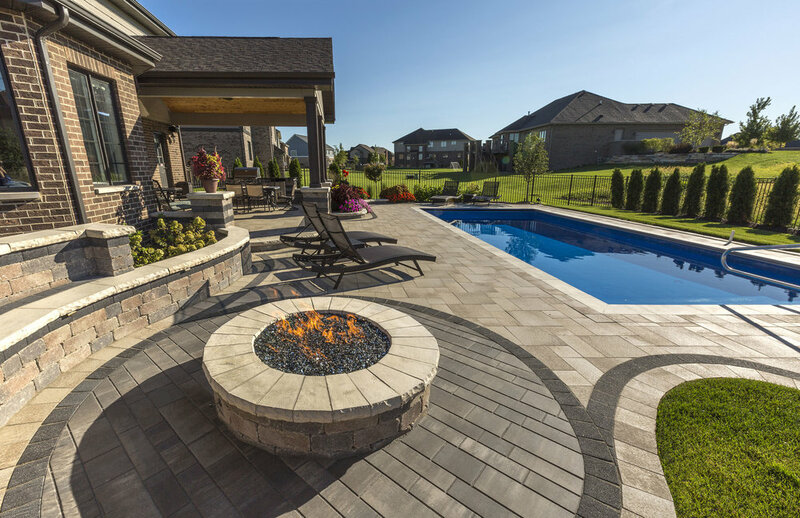 As people are naturally drawn to the welcoming warmth of a glowing fire, adding these elements to a hardscape enhances the life and energy to a property. Top brands in the industry combined with the knowledge of our specialists provide fully informed outdoor fireplace and fire pit solutions. Live outside more with a kitchen or grill. Do you have a question about fireplaces or firepits? + Do I want a wood burning or a gas fire pit? It all depends on how you intend to use your fire pit! Gas fire pits are very convenient in that you can light them and enjoy a fire very quickly, and then turn it off when you are finished without having to worry about putting out a fire with water or waiting for it to burn down. Local regulations may allow a gas fire pit while NOT allowing a wood burning firepit installation. The downsides to gas fire pits are that you should not cook on them, and you do not get the “real wood” effect from your fire. On the other hand, many people prefer “real” fires made by burning wood. If you like the process involved in cutting and carrying wood, building and tending a fire, cooking on it, and the sight and smell of burning wood, then this is the way to go. Be sure to check local regulations, as some municipalities prohibit wood burning fire pits. If you do prefer wood, be sure to check out the Zentro Smokeless Fire Pits HERE (link to Zentro product page). Available in both freestanding and in insert style, the Zentro DRAMATICALLY reduces the amount of smoke a wood fire produces. + Do I need to cover my firepit when I’m not using it? It is best if you do. For gas fire pits, this will keep water intrusion to a minimum, which will make the gas components last as long as possible. For wood fire pits, covering when not in use will keep the mess to a minimum. If you’ve ever tried to clean up wet ashes, you would understand why keeping them dry makes life much easier. + Do I need ventilation in my stone or paver firepit if I am using an insert? Yes, ventilation is always recommended. Not only will ventilation aid in combustion, but it will also allow water and moisture to dry out from under the pit. For gas fire pit, it will allow gas to escape in the case of a leak. Cross ventilation (vents on both sides) is the most effective way to allow air to circulate.